A delightfully unspoilt and picturesque resort set against one of the most dramatic glacial backdrops in the Alps. 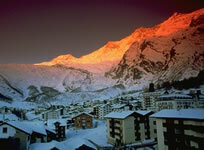 Saas Fee is a high altitude mountain village centered on narrow streets lined by attractive chalets. Designer ski shops run alongside working farmhouses where you can purchase fresh milk. Its a long walk from one end of the spread-out village to the other. Depending on where your staying, your hotel may provide a courtesy bus, or, be prepared to walk to the lifts. Saas Fee is traffic-free and upon arrival you must leave your car (for a fee) at the carpark at the edge of the village. 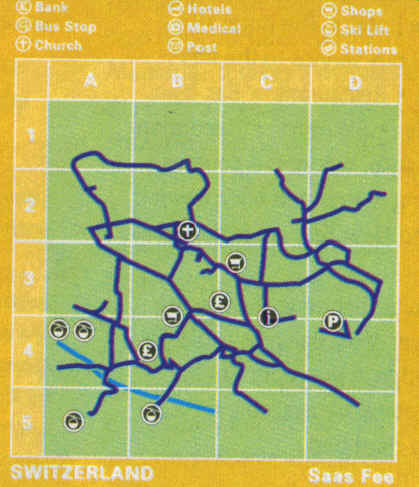 The area has been steadily improved with new lifts, however the area is still rather fragmented. The glacier provides guaranteed snow, but also cold conditions. With the glacier moving 100m every year, meaning drag-lifts pylons are moved to cope. no shortage of nightlife, especially with Popcorn and Happy Bar - two of the best Swiss snowboarding bars. try Nesti's or the Black Bull straight after skiing.